An image of the newly discovered galaxy cluster SPT-CL J2106-5844 in the optical and mid-IR. The white contours are X-ray emission. From Foley et al. (2011) Figure 4. In my last post I discussed new research illustrating how galaxy clusters are used as testbeds for studying the evolution of galaxies. The clusters studied in that paper were in the nearby universe: at z=0.04, a mere lightyears away. 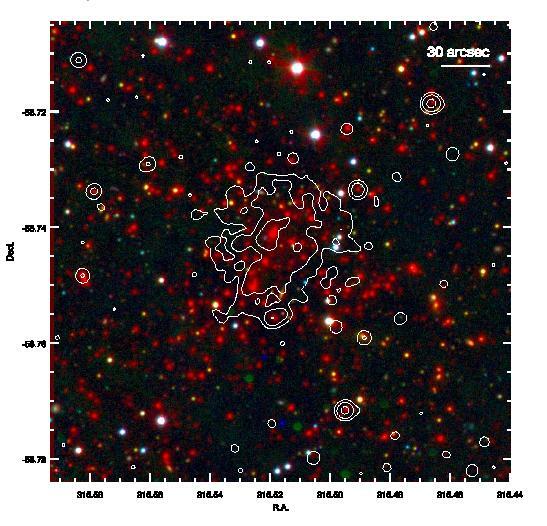 New observations from the South Pole Telescope in Antarctica have revealed the existence of cluster SPT-CL J2106-5844 at , the most massive cluster ever found beyond z=1. The redshift (z) of an object implies not only a distance, but a lookback time. Observing at z=1.1 means, depending on the cosmological model you adopt, looking back to when the universe was only about 5.5 Gyr old. The opportunity to observe a large cluster of galaxies in the early universe may yield important constraints on models of galaxy formation as well as cosmology. 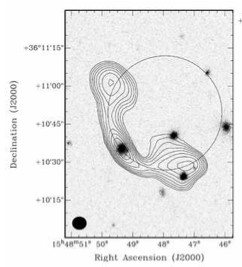 The key to finding this cluster was the thermal Sunyaev-Zel’dovich (SZ) eﬀect. The SZ effect causes cosmic microwave background (CMB) photons to gain energy when they pass near to (are scattered by) very high-energy electrons. This is the inverse of the familiar Compton scattering process. Galaxy clusters have plenty of extremely energetic electrons in their superheated ( K) intracluster gas. The SZ effect depends on the number of high-energy electrons (e.g. mass of the cluster), but the amazing thing about it is that it acts independently of redshift. This makes it the perfect tool to search for clusters in the early universe, although the change to the spectrum of the CMB caused by the SZ effect is small and therefore high sensitivity is needed. Other groups have had success by looking for the X-ray emission of distant clusters or the optical emission that has been redshifted into the infrared, but the effectiveness of these techniques decreases with redshift. The South Pole Telescope (SPT) is a 10 m microwave (millimeter) telescope surveying 2500 square degrees of the sky in three different filters. Very sensitive millimeter observations require stable atmospheric conditions, high microwave transmission rates to the surface, and low atmospheric emission (background). The SPT collaboration found that a site in Antarctica, with little turbulence and emission due to low water-vapor and atmospheric pressure, is ideal. Once the cluster had been discovered, the authors took additional observations to help characterize its properties. From combined measurements via the SZ effect, X-rays, and optical spectroscopy they estimate a cluster mass of (solar mass) cluster (about 1000 times the mass of the Milky Way). Perhaps the authors’ most fascinating result came from a likelihood analysis made from Markov-chain Monte Carlo (MCMC) sampling from current cosmological expectations of the parameters of the universe. We don’t expect to see many very massive clusters in the early universe because it takes time for them to form by gravitational collapse. They find that only one galaxy cluster as massive and as distant as SPT-CL J2106-5844 should be expected in the entire sky, and that the odds of coming across it in their survey are only 7%. Perhaps the SPT was lucky enough to come across this cluster, but if more such clusters were to be discovered it could indicate flaws in some part of our understanding of the universe. In any case, this new testbed for studying galaxy formation in the early universe should produce fascinating results. Exploring Intergalactic Gas Using Radio Galaxies The First-Ever Detection of the Kinematic Sunyaev-Zel’dovich Effect The Top 12 of 2012 When did massive structures of galaxies form?